AMG has been tuning Mercedes cars since the 1970s, and would work on any model if you had enough money. Over the years they have produced not just sports cars, sedans, and coupes, but wagons, SUVs and minivans, too. Let's check out a few. Starting in the late 1970s AMG began tuning the smaller W123 chassis with all sorts of aftermarket parts. They also offered buyers a much higher performance model, developed by pulling the stock straight size motor, and dropping in the 5.0 liter V8 from the larger car. The motor was slid right back to the firewall, and some cast iron bits were replaced with aluminum to produce a well balanced car, especially in the rare wagon body style. 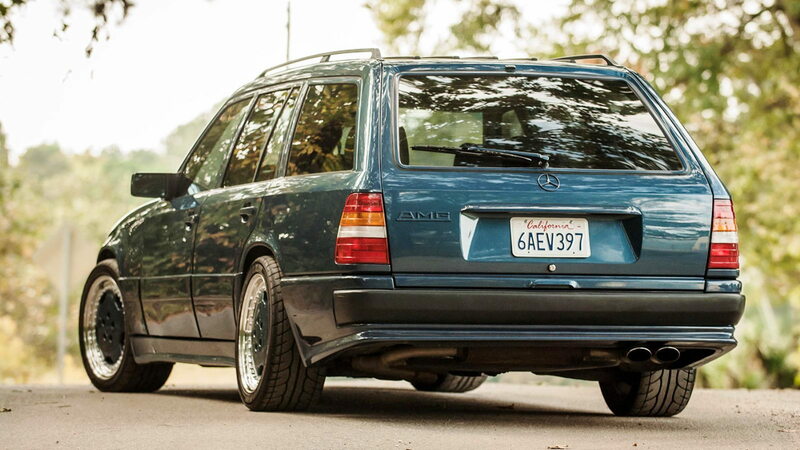 All you needed was a brand new Mercedes wagon, and an extra $27,000 to spend, and your wagon could have 276hp and a top speed over 140 mph, too. 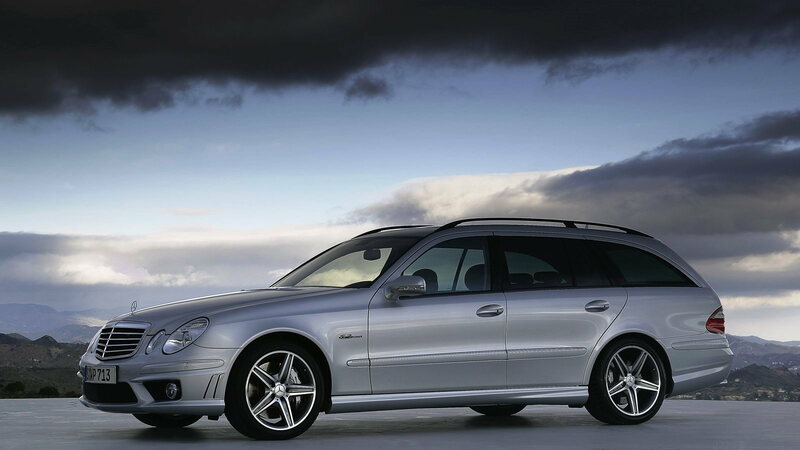 >>Join the conversation about The Rare AMG Wagons right here in the Mercedes-Benz World Forum! The 300E "Hammer" with the 6.0 liter motor is the car that really put AMG on the map, and eventually lead to Mercedes-Benz buying them out as their in house tuner. As had always been the case, if you wanted one bad enough and could pay for it, AMG would perform their magic on any of the cars in the lineup. This 1987 wagon is said to have cost $190,000 when it was built, and took nearly a year to complete. When it sold at auction in 2010, however, it couldn't even top $42,000, though it was in great shape and still owned by the original owner. The 6.0 liter, 4 cam, V8 motor, produces a claimed 375 hp, and will get you to 60 mph in just 5 seconds. You can read all the details and enjoy the pictures at Petrolicious. 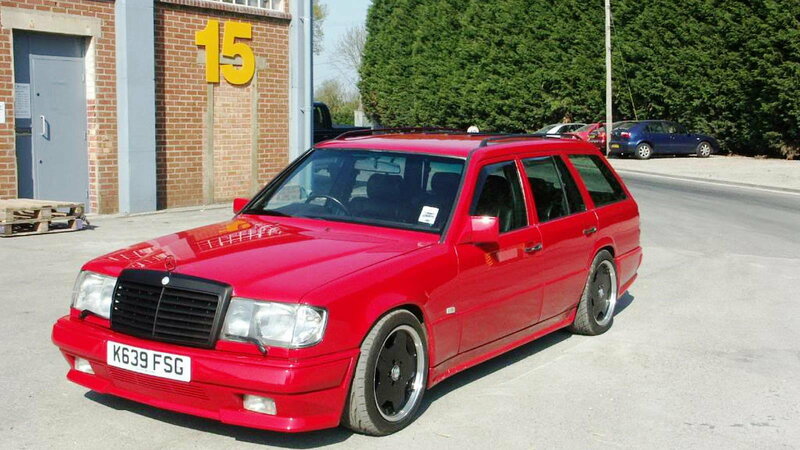 Later, the AMG version of the wagon became a regular offering, from 1988-91. These cars were not quite as extreme as "The Hammer" with just a bigger tuned version of the straight six instead of a V8 under the hood. Still, you got over 275 horsepower, and handling and brakes much better than you'd ever need to get the kids to school on time. Drive one of these and you were definitely the cool dad in the car pool. 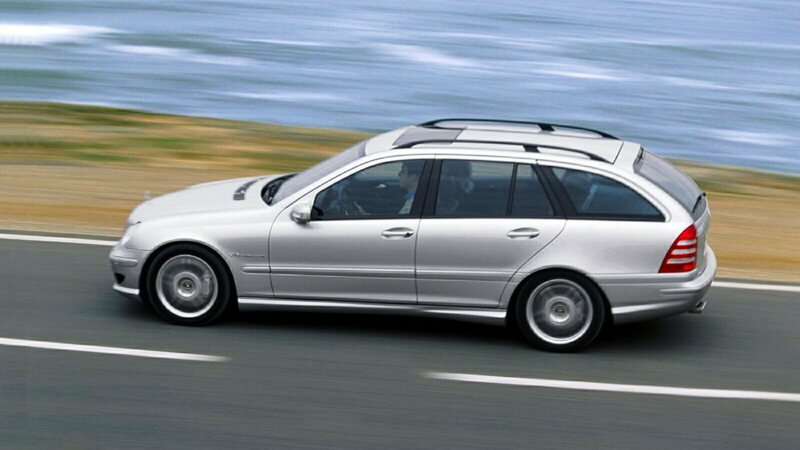 These 21st century wagons got all-wheel drive and a nice fat 5.5 liter V8 good for more than 350 horsepower. Of course, being a modern Mercedes, it already had brakes and handling to spare, so chaperoning the school field trip at over 150 mph was perfectly safe. Even so, AMG tweaked everything, with stiffer springs, lower profile, wider tires, bigger brakes and a lower ride height, just to be certain. 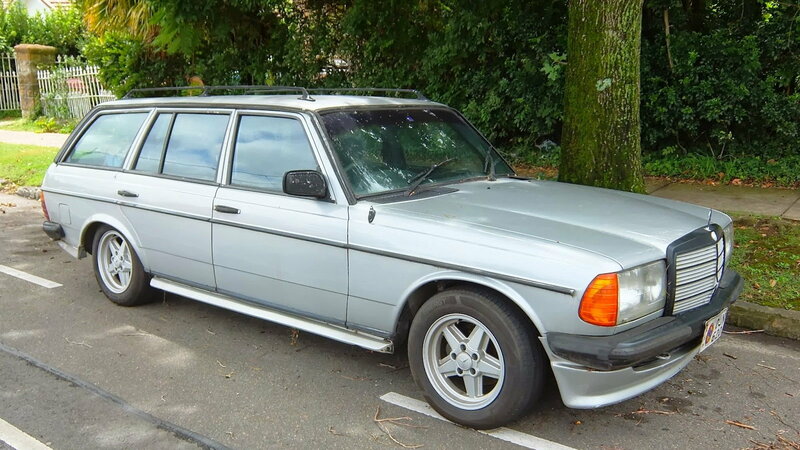 These were officially offered by Mercedes dealers, so unlike the earlier AMG wagons, they can be found for sale fairly frequently, though they aren't cheap. 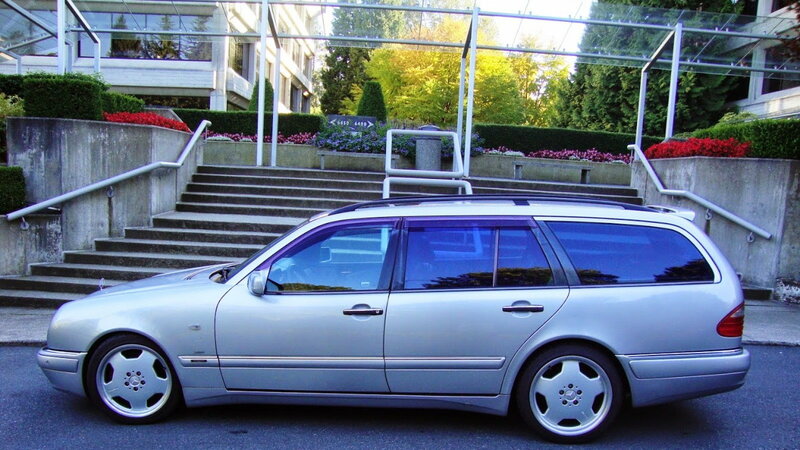 This oddball car right here ought to be the darling of automotive journalist, because it was a tuned, high performance, diesel powered, station wagon. The AMG tuned 3.0 liter straight 5 motor may have produced just 231 horsepower, but more importantly it put out 398 lb-ft of torque! It would cruise at 150 mph, and if you kept it down to legal speeds, it would give you 36 miles per gallon. However, folks were not all that keen on a sporty diesel car, even with AMG spec wheels, tires, brakes, and suspension, and they only sold them from 2002-2004. The same body style could be had with a AMG tuned and supercharged gas motor under the AMG C32 nomenclature. The Mercedes-Benz W211 chassis debuted in 2003 with a new look and a new platform, and AMG continued to offer their tweaked versions. First on hand was the E55, with a supercharged 5.5 liter V8 motor, and all the usual improvements to the rest of the running gear. Car and Driver magazine tested the wagon version and actually found it to be quicker to 100 mph than the 250lb lighter sedan, needing just 9.7 seconds (just 4.1 for 0-60 mph). With the face-lifted model in 2006 AMG again applied their magic, this time with a naturally aspirated 6.3 liter V8 motor, which made more power but less torque, and is actually slower by some measures. The E55 has 469 hp at 6100 rpm and 516 lb-ft at 2650 rpm, compared to the E63 with 507 hp at 6800 rpm and 465 lb-ft at 5200 rpm. 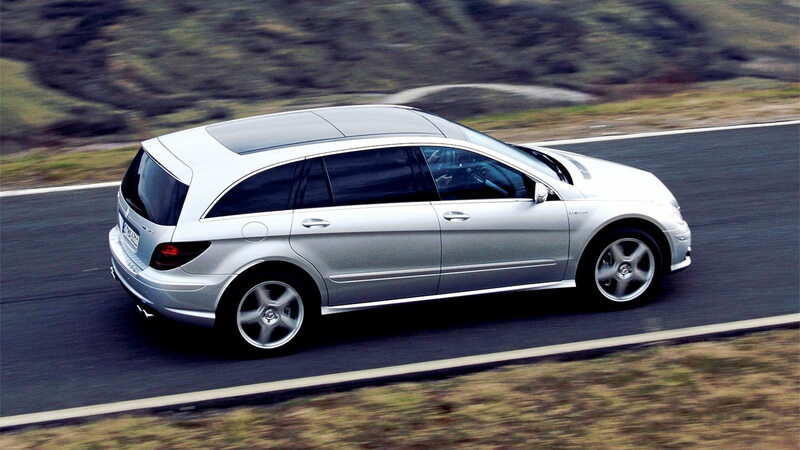 Either should be considered one of the fastest family wagons ever offered in America. If it wasn't for David Beckham and Posh Spice having kids, this insane AMG minivan might not exist, since they are the only known owners of one. Once Mercedes and AMG had the 6.3 liter drivetrain and 7 speed automatic in other cars, it was a simple thing to slip it into the people mover. Only offered in 2007, and then only by special order, M-B could not have sold more than a few hundred of them, since they only sold 13,000 R-class vehicles total worldwide in all configurations. If you are looking for the most powerful minivan ever, this AMG model has 500 hp and 465 lb-ft of torque, and will get you to 60 mph in just 4.6 seconds thanks to the traction from the AWD system. You could carry up to 7 passengers, but chances are that would negatively affect your performance. At just $87,400 these were actually the bargain of the AMG 6.3 liter lineup.